Sponsored Content: Collection B Offers Haute Jackets At A Hauter Price! There is nothing hotter than looking fierce and being smart! The key to this winning combination is learning how to look like a million dollars while spending less than one hundred! That's right! All of the jackets that I am about to show you via Collection B are less than one hundred dollars! It is so awesome when you can be on trend AND on budget! Let's start shopping shall we? My favorite jacket from Collection B is their Hanna Quilted Cotton Twill Jacket with Faux Leather Sleeves! This jacket can take you so many places from uptown to downtown and has a look that will make people say, "I want her jacket!" I love Collection B's Asria ﻿Sleek Softshell Hooded Jacket. What is chicer than New York Black? The slanted zipper detailing adds edge and fun to change things up a bit! It is also fun to play with the amount of zipper you want zipped up. Just a little higher or lower can change a look completely! Who does not love a good bomber jacket? Collection B's Ayra Sherpa-Lined Faux Leather Aviator Bomber is the perfect thing to be on trend with women rocking men inspired looks. The faux leather and bomber design give it a masculine edge while the fit keeps it fun and fem! 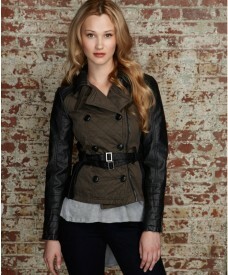 I love the lines that Collection B's Leila ﻿Sueded Belted Jacket with Detachable Sherpa Collar provides. I am all about a good belted situation. Also, the fact that the Sherpa collar is detachable means two looks for the price of one! WORK! My second favorite jacket from Collection B is their Yvette Faux Shearling Jacket with Sherpa Details . I am all about the elegant neck and body of this jacket. It is great to see a jacket that can be warm and can still give girls a touch of elegance. Be sure to check out Collection B's site to see the other pieces they have to offer by going directly to their site www.collectionb.us/!